I just finished my fourth Jodi Picoult novel this afternoon. I was sitting poolside and vowed not to get up until I finished it. My redder-than-usual arms attest to the follow-through. It’s an interesting thing about “Jodi books” – they provide conversation starters and bonding opportunities. As I was sitting engrossed in the last 75 pages of the book, a woman whom I never met came up and asked me what I thought of the story so far. We ended up having a 10 minute conversation about various references in Picoult novels; another woman joined in when she overheard the conversation. Yes, Jodi Picoult is known for her in-depth, well researched twisted, surprise endings. Handle with Care may be her saddest story yet. I have to admit that I shed a few tears while reading – only accomplished once before while reading My Sister’s Keeper. I am personally impressed with the thorough background on osteogenesis imperfecta (serious brittle bone disease) and the realistic trial experience. Charlotte and Sean O’Keefe’s daughter, Willow, is born with severe OI. As the family struggles to make ends meet to cover Willow’s medical expenses, Charlotte thinks she has found an answer. If she files a wrongful birth lawsuit against her ob/gyn for not telling her in advance that her child would be born severely disabled, the payouts might ensure care for Willow. But it means that Charlotte has to get up in a court of law and say that she would have terminated the pregnancy if she’d known about the disability – words that her husband can’t abide, that Willow will hear, that their daughter Amelia also painfully takes to heart and that Charlotte cannot reconcile. And here’s a really sad twist: the ob/gyn she’s suing is her best friend. This twist brings up questions on friendship: can a very strong, old friendship be broken instantly? Is family more important than friends? Can a broken friendship be put back together? Grading Girl recommends this book to anyone interested in exploring medical ethics and personal morality. When faced with the reality of a fetus who will be disabled, at which point should an OB counsel termination? Should a parent have the right to make that choice? How disabled is TOO disabled? And as a parent, how far would you go to take care of someone you love? Would you alienate the rest of your family? Would you be willing to lie to your friends, to your spouse, to a court? And perhaps most difficult of all – would you admit to yourself that you might not actually be lying? If you’re looking for a light summer read, this may not be your rag right now. But if you’re interested in these compelling questions, this gut-wrenching tale will keep you thinking. One element I truly admire about this story is that Picoult illustrates it in the second person point of view. This view is rarely used; in fact, I plan on using this book as a model for defining point of view to my students who have a hard time grasping that the second person point of view is when the narrator is speaking directly to another character using the pronoun “you.” The chapters rotate between five narrators : Charlotte (mom), Sean (dad), Amelia (sister), Marin (lawyer), and Piper (best friend being sued). Each of these characters reveals how they see events unfolding to Willow, the little girl with OI. They are explaining themselves to Willow, in a sense. A cool effect is that the reader feels viscerally what it’s like to be at the center of this controversy. 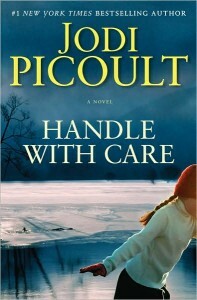 Grading Girl gives Handle with Care an A-. The minus is given because I wasn’t happy with the ending (hey, who said grading is objective?). Some readers will misinterpret Willow’s motivations in the end. Her actions seem uncharacteristic of her intelligence. For fear of writing spoilers, I’ll say no more. Just go out and borrow or buy this book for another page-turning Picoult. Your time will not be wasted, GG assures you.